Like all other successful construction work, Hydrodemolition requires meticulous planning and preparation. 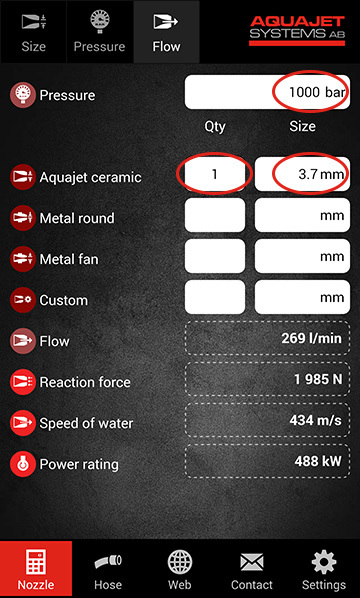 To make your work a little easier we have created a smartphone app to help you calculate water flow, speed and pressure, and reaction forces. The first window is where you calculate nozzle size from a given pressure and flow. Type your values into the white fields for pressure and flow and then select the number of nozzles that should be used. Just leave the other fields blank. The results are displayed in the dashed fields. 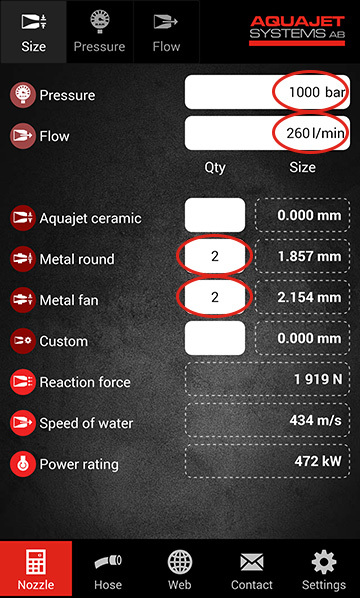 The app also supports calculation of multiple types of nozzles in the same setup, for example a Rotolance equipped with two round nozzles and two fan nozzles is a common setup. The Custom nozzle field is activated in the Settings menu. 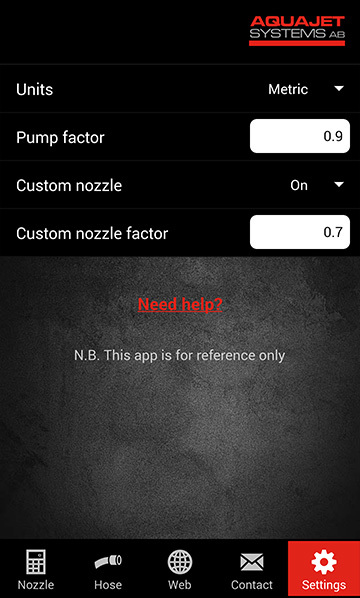 This allows you to calculate any brand of nozzle. 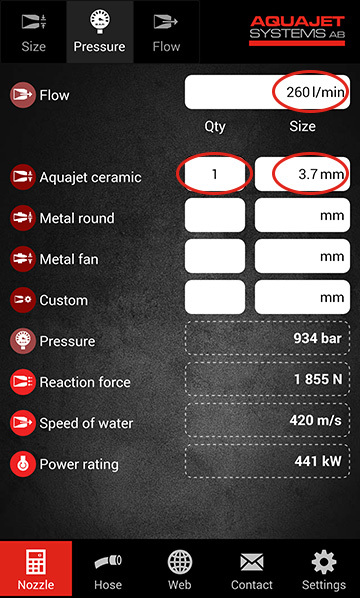 By selecting pressure in the upper menu bar it is possible to calculate the pressure from a given flow and nozzle. It is also possible to calculate the pressure when using multiple nozzles. By selecting flow in the upper menu bar it is possible to calculate the flow from a given pressure and nozzle. It is also possible to calculate the pressure when using multiple nozzles. 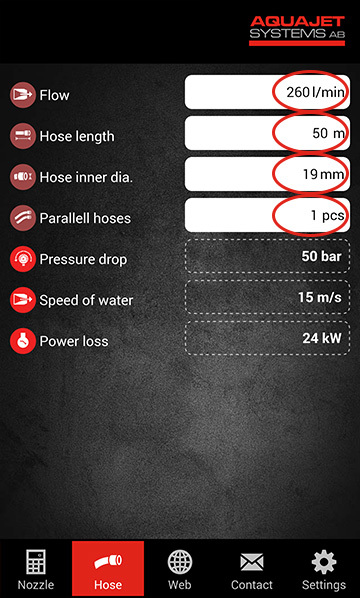 The hose calculation will help you calculate the pressure loss in the high pressure hoses. Type your values into the white fields. The results are displayed in the dashed fields. Read about our products, news and accessories. 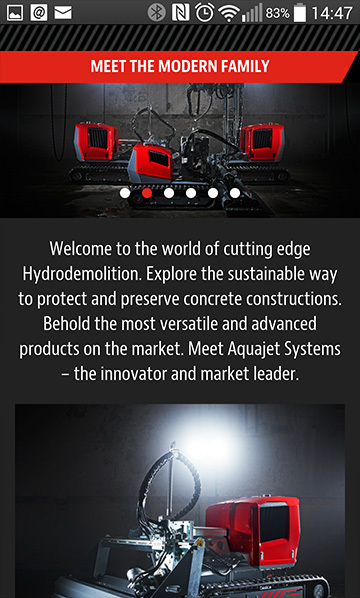 Also a lot of examples of different applications and information about Hydrodemolition. Contact us directly from the app or find us on the map. 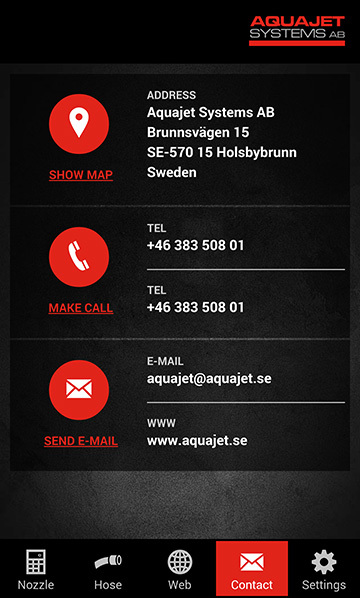 Feel free to contact us with any futher questions about the Aquajet app.